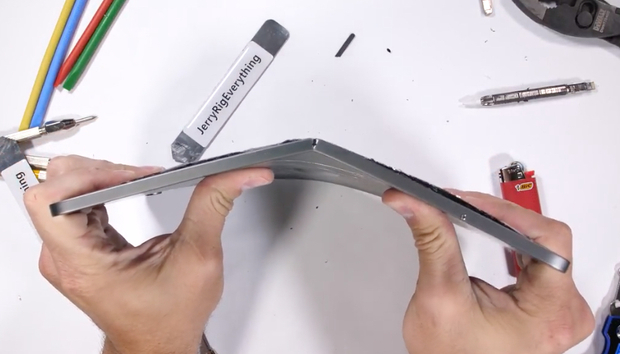 Judging by a new YouTube video from JerryRigEverything, we’re supposedly on the verge of a new “Bendgate.” Holding the edges of the new 11-inch iPad Pro in the video, host Zack Nelson jams his thumbs into the back of the tablet, pulls, and—shock, I guess?—the $799+ tablet cracks and then folds together like a chapbook of college poetry. The bend specifically happens near the microphone hole, where the structural integrity would be weakest. It’s definitely something we’ll keep an eye on, but I’m not really sure what other outcome people were expecting. To be sure, it does feel structurally weaker than previous models. I’m holding my 12.9-inch model right now, and I can easily see how I could work the same magic if I handled it with the same violence. Maybe even more easily, since it’s a larger device and so offers more leverage. That’s partly due to the wide, flat expanse of aluminum on the back, but the new flat edges for charging the Apple Pencil may also be at fault. The metal on my first-generation iPad Pro feels slightly more resistant, possibly because of the tapered edges on the old design. Make no mistake, though: If I wanted to bend back the older iPad Pro, I could. Fortunately, I’ve managed not to do that since 2015. I don’t think there’s much cause to worry, as I already put the latest device through a trial by fire for my review through my own carelessness. I’d cram it in the same thin slot in my backpack where my 13-inch MacBook Pro was already stuffed (although I almost always kept it in the Smart Keyboard Folio case). I also crammed my bag with everything from Bose QuietComfort 35 headphones to bottles of mineral water, and then I’d lean against the whole bag while standing in cramped San Francisco subway cars. At one point I even used my bag for a pillow. I did this for days. In other words, the 2018 iPad Pro had plenty of chances to bend just in the tumble of my everyday life, and I’ve yet to see it do so. The only thing I really haven’t done is sit on it by accident, and I’m in no hurry to try that. “Bendgate” for the iPhone 6 was a very real thing, and even my phone ended up being slightly bent below the volume buttons. But phones go through different hells than tablets. We drop them. We stick them in the back pockets of skin-tight jeans. As Apple’s Screen Time feature reminds us, we spend perhaps too much time with them in our hands. But tablets? It’s harder to lose track of them, and I’d say the vast majority of us hold them in ways that are less likely to lead to bends. Even then, most people I know use their iPads with some kind of keyboard case, which tends to keep such accidents from happening as a matter of course. For that matter, they have gigantic glass screens. I know I personally handle them with a little more care than my phone as a result. Something like this is more of a serious scandal for phones since they’re tiny pocketable devices and should be more sturdy for that reason alone. Tablets, though, basically amount to massive sheets of glass and metal sandwiched on top of each other. Sure, every single tablet I’ve handled will bend or break if I jam my thumbs into the back and push with all my strength. But then again, so will my MacBook’s display—and far more easily. And yet we never hear about controversies with them. So take this as a lesson: Don’t forcefully try to bend your iPad. As for a new Bendgate? I think we’ll be fine.